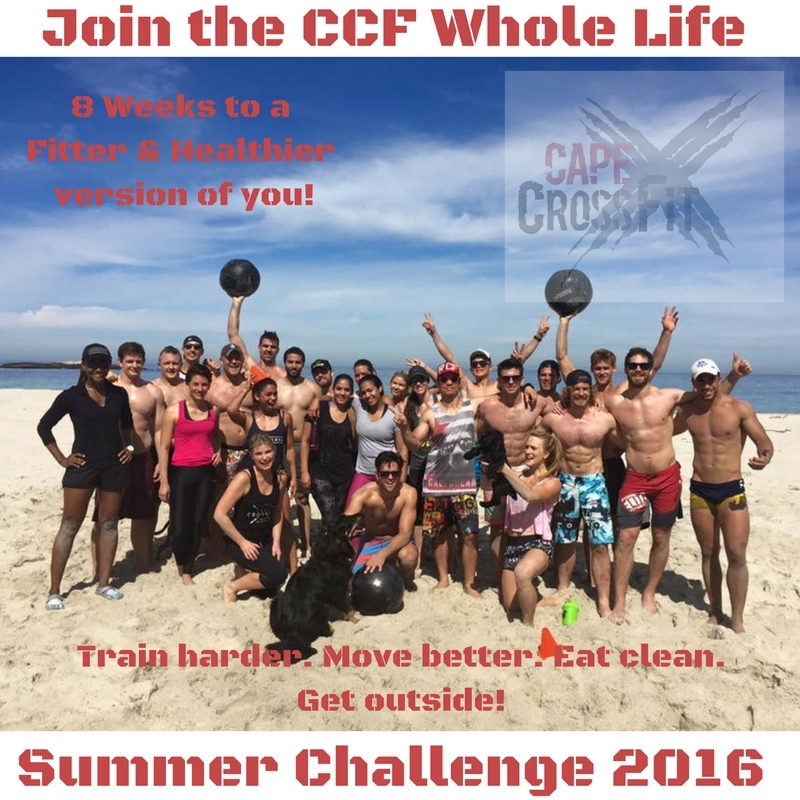 Enter the "Cape CrossFit Whole Life Summer Challenges" and become the fittest version of your self in 8 weeks! Want to improve your Fitness and Health? Want to eat better so you can perform better (and look better)? Want to create a functional lifestyle that sets you up for living an active and healthy life? If so the "CCF Whole Life Challenge - 8 weeks to Summer" challenge is for you! Our CCF Challenges always seem to bring the best out of our members in terms of performance improvement, healthy eating and therefore body composition. This time around we have 3 Challenges that run simultaneously for 8 weeks and the entire purpose is to guide our members towards a lifestyle that won't only get them in the shape of their lives for summer, but also a lifestyle they can keep forever. Just show up for class in any of the 3 CCF Boxes on Friday and have some fun. Then, train as hard as you can for 8 weeks and see how much better you can become. Obvious Sandbagging will result in disqualification. What? 2 Tests that will test your Fitness Capacity. One is a Gymnastic Max Effort and one is a combination of 3 Classic CrossFit Benchmark WODs! When? The "Baselines" for these two tests will be set in ANY class on Friday the 30th of September. The Finals will be held at our Gardens Box on Friday the 25th of November! How? We will have two categories of prizes, "RX", "Modified" with prizes for both "Best Performance" and "Best Improvement". Cost? R100 (cash only) - all of it goes back to the prize pool. Last time the winners walked away with more than one month's membership fees! Our CCF Nutritional Advisor, Coach Tash, will be running this challenge and each week the participants will be sent out guidelines on how to make it easy to keep a healthy lifestyle. This challenge does NOT demand that you eat "Paleo", even though it's an option. We focus on eating healthy sources of food, but if you already have done the "Whole 30" for +21 days and then figured out that for instance rice works really well for you, then it's perfectly fine to have that too. What? 8 weeks to improve your body composition. When? The "Baseline Measurements" for this challenge will be set during this week, see the available slots for Measurements OR book a Goal Getting Session with your assigned coach to get yours! The Final Measurements will be done on the week of Friday the 25th of November! How? We reward best body composition improvement, (Body fat % lost, we don't really care about the scale), and then the coaches vote for best changes in before and after pictures. Cost? R200 (cash only) - most goes back to the prize pool. Last time the winners walked away with way more than one month's membership fees! CCF GARDENS: 16.00-18.30 on Wednesday the 28th of September. CCF FORESHORE: 16.00-18.00 on Thursday the 29th of September. CCF NEWLANDS: To be determined. If non of the above times suits you please contact your Assigned Coach or the [email protected] ASAP so we can book you in for a 20min Goal Getting Session to book your measurements! This Challenge kind of brings it all together. There is no fee to enter the challenge and Cape CrossFit and Nutritech are sponsoring some prizes to the winners, but what we really are looking at doing here is to turn ALL our members into winners by improving their Lifestyle through a better structure towards their own Health & Fitness. Cape CrossFit was started as an idea to make people fit enough to handle every day life, but also to live a more active lifestyle whenever possible. With improved fitness we have seen throughout the years how our members take on challenges they probably never thought was possible before starting with us. It may be climbing mountains, playing with their kids on the beach or taking up a new sport - no challenges are too big for our members and we now want to build even more reason for you all to Use Your Fitness! What? An 8 week "Points Challenge" where you will have to fill in your score card each day and get some of the pieces validated. How? You have 5 different ways of earning points in this challenge: - CCG Classes, 1p. Max 6p per week. (Have to be signed off by your coach). - 10min of Mobility, 0.5p. Every day of the week. (RomWOD counts). - Eat Clean, 1p. We will provide you with a list of what is not ok, you give your self 0/1p each day. - Goal Getting Sessions, 3p. Max 2 during the 8 weeks that the challenge is running. (Signed off by coach). - (+)20min Outdoor Activity, 5p. Max 1 per week will give points. This has to be something that uses your fitness. A hike, a touch rugby game, a 5k run. (You must hashtag #CCFWholeLifeChallenge for the points to count). So, sign up for these challenges and become the best version of YOU! We are behind you and your fitness journey all the way. No Excuses. Only Results. PS. 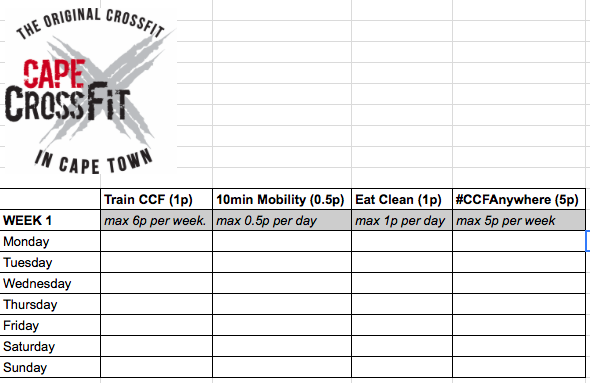 If you are not a Cape CrossFit member yet, but keen to take on these challenges get in contact with us ASAP to book your free intro so we can set you up for success and you'll be able to join the challenge as soon as you become a CCF Member!